Here at APHC we do not have any visiting hours set. You are welcome to come visit anytime. What role does Social Services play at Aneta Parkview Health Center? Should you wish to have Aneta Parkview Health Center wash the laundry please notify the front office upon admission. Subsequently, if a family/care giver is going to take care of the laundry at home, please let the nursing station know your plans. This way, the staff can place a sign on the closet door notifying our housekeeping staff to leave the clothing for family pick up. We request that family provide a hamper for clothes and pick it up twice a week. We have the Rebecca room, family room and private dining room available for any special event (birthday, holidays, meals). Or consider using our Send a Greeting feature on the website. Just type the recipients name and type your message. When it arrives in our email box we will print it and hand deliver it to your loved one. For the safety and welfare of all residents and staff, Aneta Parkview Health Center is a non-smoking facility. We always want our residents to be comfortable; if space permits, small personal items from the resident’s home are always welcome. We have a beautician available Monday, Wednesdays, Fridays and by appointment if requested. Haircuts and styling are included in the room charge. Perms and colors will be billed to the resident. We provide free cable television in them but you are responsible for your own television, please consult with our maintenance director to ensure proper placement according to county fire codes and safety. We prefer flat screen televisions that can be wall mounted. Private phone access is available to every resident upon request at no charge. Unlimited local and toll free calls can be made. An unlimited number of phone calls from any incoming area code (national or international) can be received. If a phone is desired in the resident’s room, payment and setup must be arranged between polar communications and the family.Please inquire about Internet access. Aneta Parkview Health Center has a vibrant atmosphere with dynamic, individualized activities that match the capabilities and needs of residents and their guests. We also have active resident and family councils and volunteer programs. Scheduled activities include: music, fitness activities, religious meetings, outside entertainment, games, gardening, field trips/outings and volunteer involvement. If you would like to arrange something special or have suggestions and ideas for individual or group activities, please inform our activities director. We welcome and encourage involvement from family and friends. Our primary concern is that your loved one feels comfortable here at Aneta Parkview Health Center and that their needs are being met. You should feel secure and at ease with our staff, particularly those providing direct care. If you have any concerns or praise for our staff, please feel free to contact our social services department. They will be able to address any apprehensions you may have regarding any particular staff members. Suggestions and recommendations for changes in the facility rules may be submitted in person or in writing to Aneta Parkview Health Center administration. Aneta Parkview Health Center employs a full time Business Office Manager for all financial and billing concerns. Should you have any questions regarding these matters please make an appointment to see our Business Office Manager by contacting the front desk/receptionist. A Certified Nursing Assistant (CNA) is a health professional who works under the supervision of Registered Nurses (RN’s) and Licensed Vocational Nurses (LVN’s) to provide a wide variety of basic hands-on patient care. CNAs perform basic nursing functions such as personal care, taking vital signs, positioning residents, and ambulation. An LVN provides basic bedside nursing care to residents under the direction of a physician or registered nurse. Duties within the scope of practice for an LVN typically include, but are not limited to, provision of basic hygienic and nursing care; measurement of vital signs; basic client assessment; documentation; performance of prescribed medical treatments; administration of prescribed medications; and, performance of non-medicated intravenous therapy and blood withdrawal. An RN’s duties may include everything a CNA and LVN carries out, in addition to administering an IV, assessment of patients, skin care, and process doctors’ orders. Furthermore, RN’s typically take on management positions such as the Director of Nursing, who is responsible for all nursing duties in the building. What happens when my loved ones stay at Aneta Parkview Health Center is over? What options do we have? If you’re feeling ready to take the next step in your recovery, Assisted Living is a natural progression. Assisted Living centers (sometimes called Retirement Centers) provide care for seniors who are healthy enough to not require nursing or therapy, but aren’t quite sure if they are ready to transition home alone. 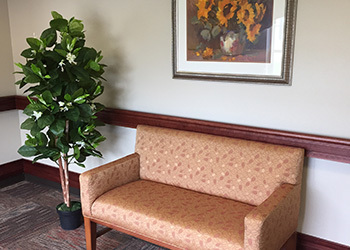 Assisted Living centers cater to seniors who want a more “homelike” environment but with the added security of someone to check up on you 24 hours a day. Services typically include medication management, a wide array of activities, transportation to doctor’s appointments and outings, furnished rooms, healthy and balanced meals, and socialization. Assisted living residences are registered, licensed or certified at the state level, usually by the department of health. Prior to discharging home, make sure to think about the environment you will be returning to. How many steps do you have to climb? Do you have adaptive equipment to aid in bathing? Who will be providing you groceries and cooking? How will you get to Dr’s appointments or the pharmacy? Can you care for yourself independently? If you can answer each of these questions in the affirmative, you are probably capable of returning to home independently.